Introduction The sun’s intensity over the last year has been at about its lowest recorded value since we began taking direct measurements, using satellites in the 1970’s. You sure wouldn’t know it given the relative warmth much of the planet has been experiencing over the last year. This is not to say that every place has been hotter than normal all year—constantly shifting weather patterns create quite a bit of variety across the globe—but it has been hotter more often and in more places than not. In fact, the last year (second half of 2009 and first half of 2010) is the hottest 12-month period since at least the mid-1800’s as estimated by NASA, or a close second as estimated by the Hadley Center in the UK. Throughout the Indian Ocean and Southeast Asia (especially from Thailand through the Philippines), the high temperature stress has resulted in widespread coral bleaching. Forecasts from the National Oceanic and Atmospheric Administration (NOAA) suggest that the risk of coral bleaching is high for the Western Pacific and the Caribbean as we approach the warmest weather of the year (temperatures usually peak between August and October in the Northern Hemisphere tropics and subtropics). This July, I welcomed visitors from New York who happened to miss the triple-digit heat wave, and instead were able to enjoy the 81 °F days and 74 °F nights we had here in Kane’ohe. The moderate weather is projected to last through the summer here in the main Hawaiian Islands, and we aren’t expected to be at elevated risk for bleaching this year. The Northwestern Hawaiian Islands, especially Kure and Midway Atolls and Pearl and Hermes Reef, may not be so fortunate—NOAA is projecting the potential for severe bleaching. With any luck, temperatures in these regions will peak on the low end and not on the high end of where they might, and the reefs that grow there will largely escape bleaching this year. I’m keeping my fingers crossed. Last time we discussed typical temperature ranges for the water masses around coral reefs. Different coral reefs in different regions experience somewhat different annual temperature ranges. We saw that on Sombrero Reef in the Florida Keys, temperatures typically fluctuate from the low-70’s F in winter to the mid-80’s F in summer, but that the range in any given year can be even larger (mid-60’s F in the winter to upper-80’s in the summer of 2009). In other places, such as Palau, the average annual temperature range is much more moderate: the low-80’s F in winter and the mid-80’s F in summer. As I alluded to last time, these monthly averages, averaged over many years, don’t tell the whole story of temperature on coral reefs, nor do even the instantaneous weekly averages as reported, for example, by the NOAA Coral Reef Watch system. To illustrate why, let me tell the story of some of our local reefs. Kane’ohe Bay I live in Kane’ohe, Hawai’i, a small hamlet nestled between the cliffs of the Ko’olau Mountains and Kane’ohe Bay on O’ahu’s northeastern shore. The bay is relatively shallow throughout with a maximum depth of only about 40 ft. It is also absolutely chocked full of coral reefs. Around most of the inner edges of the bay as well as around the few islands, magnificent fringing reefs grow. At the mouth of the bay is a well-developed barrier reef, one of only two barrier reefs in Hawai’i (the other being the extensive barrier reef off of Moloka’i). Between the barrier reef and fringing reefs, numerous patch reefs grow. The Hawai’i Institute of Marine Biology (HIMB, the facility where I work as a graduate student) resides on the largest island in the bay, Coconut Island, or Moku o Lo’e in the Hawaiian. It is perhaps better known to some as Gilligan’s Island, since the opening scenes of the TV show were filmed there. The entire island is ringed by a spectacular fringing reef, built principally by the Hawaiian endemic corals Porites compressa and Montipora capitata (though recent work by our lab suggests at least the Porites may not be so endemic after all). 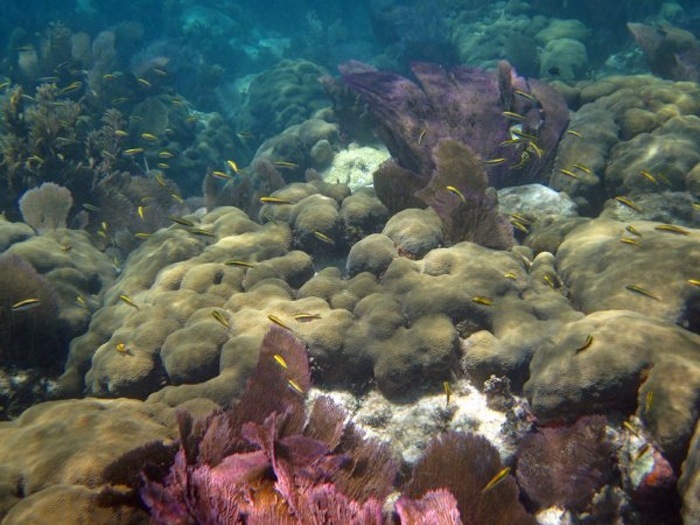 The coral growth extends into many of the inlets and boat channels right up to the edge of the water. Beside and beneath many of the docks grow wonderful coral colonies that are several feet across, and some baseball-sized and smaller colonies of Pocillopora damicornis even grow right on the floating docks themselves! It is truly a wonderful place. The reefs of Kane’ohe Bay have been relatively lucky as compared to many others in terms of high temperature stress and coral bleaching. In the last 40 years or so, only a single major bleaching event has been observed in the bay, and it occurred in 1996. Bleaching, 1996 Sea-surface temperatures typically peak during August and September near Hawai’i and begin to fall by October. Since 1956, the seasonal peak in temperatures for the offshore waters near Kane’ohe Bay (measured off of Koko Head, a few miles down the coast and exposed to oceanic swells) has been between about 79.5 °F and 81 °F in most years, with a long-term average of about 80.2 °F. One relatively cool year, 1976, only made it up to about 78.8 °F, while temperatures climbed as high as 82 and 82.4 °F in 1968 and 1974, respectively. The summer of 1996 was warmer than average too, peaking at nearly 82 °F. It ushered in significant coral bleaching within Kane’ohe Bay as well as several other areas around O’ahu and some of the other main Hawaiian Islands. The similarly warm summers of 1968 and 1976, however, did not cause significant bleaching. Is a peak temperature of only 82 °F sustained for a month or two really enough to cause widespread bleaching in Hawaiian corals? In a word, no. Corals that grow in and around the Hawaiian archipelago typically experience bleaching when the temperature rises to 85-87 °F for several weeks or more (in otherwise normal conditions). Higher temperatures would also cause bleaching, but sustained temperatures higher than 87 °F are atypical on Hawaiian reefs. The corals in Kane’ohe Bay bleached in 1996 because temperatures in parts of the bay remained between 85-87.3 °F for several weeks, even though offshore temperatures just a mile or two away never went above about 82 °F. As the summer sun beats down on the shallow bay, the water heats up. 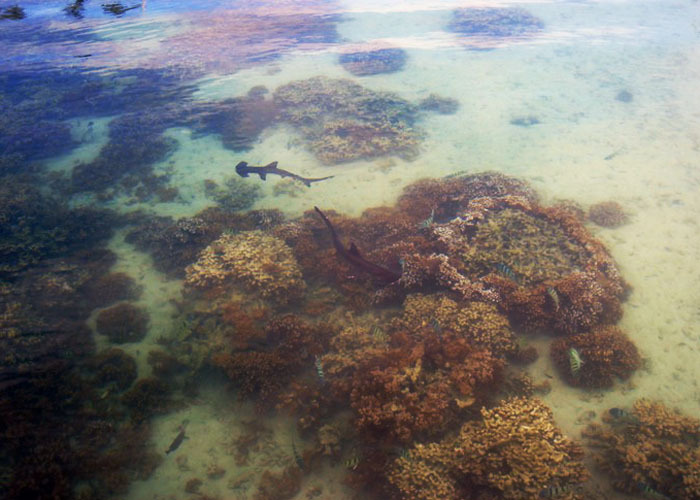 Sea water enters and leaves Kane’ohe Bay principally through two channels that cut through the barrier reef. Bay water, therefore, is not exchanged entirely freely with the open ocean. Warm water is lost from the bay to the open ocean, but only so fast. The amount of incoming sunlight (i.e., clear skies or cloudy), the rate of evaporation, and reflection of incoming sunlight strongly influence temperature in the bay, with these latter two being controlled largely by wind velocity. Summertime temperatures in the inner bay are typically 1-3 °F warmer than those offshore (or on the barrier reef). For example, the NOAA virtual station for O’ahu-Maui that we looked at last time gives the current sea-surface temperature as 79.3 °F. The temperature of the incoming sea water pumped from the fringing reef off Coconut Island currently averages closer to 81 °F. Even though the temperature of the offshore waters around O’ahu typically peak at a mere 80 °F or so, within the bay the seasonal peak is more like 81-84 °F. During the summer of 1996, Kane’ohe Bay experienced something of a perfect storm of conditions. First, offshore temperatures were higher than normal, by nearly 2 °F. Second, cloud-cover was low, allowing a great deal of solar radiation to reach the bay (and the corals, but more on that next time). Third, winds really died down for several weeks from mid-August to early September, and then again from mid-September to early-October. All of these conditions together allowed temperatures within the bay to reach 85-87.3 °F for several weeks—plenty of time to lead to significant coral bleaching within the inner bay. Any one or two of these factors alone probably would not have led to bleaching. 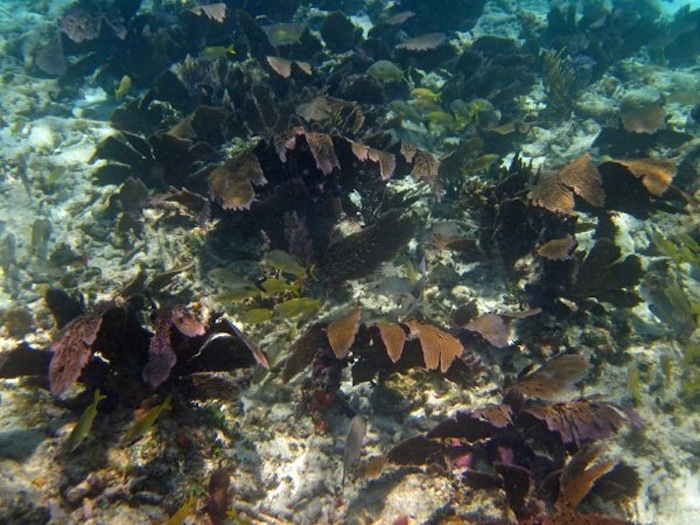 If the offshore water hit 82 °F but wind speed remained normal, the corals in the bay probably would not have seen temperatures much over 85 °F and would not have bleached. Likewise, if the offshore temperatures had not been 2 °F higher than normal, the temperatures in the bay likely would not have risen so high. It was the confluence of warm offshore water and local weather patterns that allowed abnormal warming and produced bleaching here and elsewhere throughout the main Hawaiian Islands in 1996. This event, as well as a bleaching event in the Northwestern Hawaiian Islands in 2002, are detailed by Jokiel and Brown (2004). Going back to the question I asked above, why didn’t the inshore corals in Kane’ohe Bay bleach in 1968 and 1976 despite similar offshore temperatures to the bleaching event in 1996, the answer is most likely that the conditions that allowed for additional warming in the bay in 1996 (clear skies and low wind velocity) did not occur in those earlier years. Temperatures in the bay likely peaked under about 85 °F, despite the relative warmth offshore. This is a bit of speculation, of course, but plausible speculation nonetheless. Local weather always works to enhance or reduce the risk of bleaching. 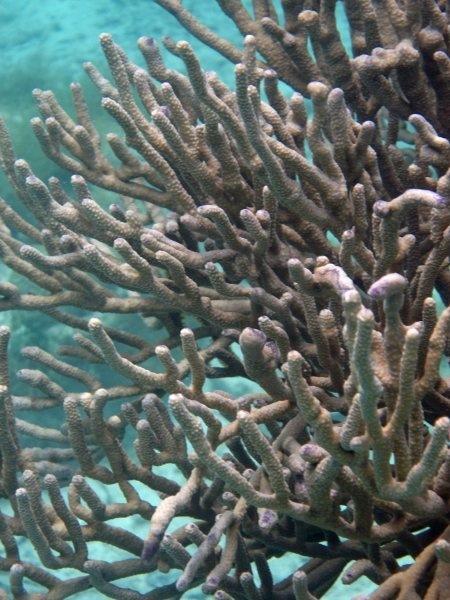 As I mentioned in the introduction, many reefs are at risk of serious bleaching this year. Let us hope that local weather patterns happen to keep water temperatures on the cooler side, rather than the warmer. Real Coral Reef Temperatures Kane’ohe Bay is far from unique in that water temperatures on the actual reefs can be (and often are) higher during the summer than in the offshore waters surrounding them. The more limited the water exchange, the more extreme temperatures often are on reefs. For instance, Barshis et al. (2010—from my own lab here at HIMB!) report summer temperature data taken on the forereef and backreef surrounding Ofu and Olosega Islands, American Samoa. Summer temperatures at the forereef site vary primarily in the range of 84-86 °F, with occasional spikes to 87 °F. Temperature at the backreef site are far more variable: rapidly varying between 84-88 °F, but with occasional dips to 82 °F and spikes to 90 °F. It is common here for temperatures to vary by 5 and even 10 °F in a single day. 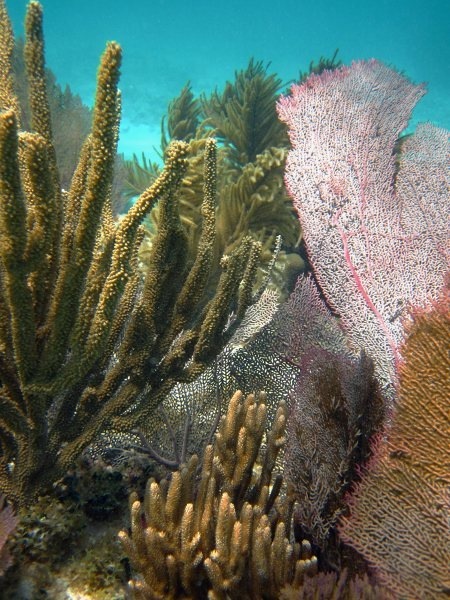 Corals are healthy and grow prolifically at both sites. Before anyone gets too excited about replicating those conditions in their home aquarium, let me say that there is some clear adaptation amongst the corals to the backreef conditions. One should not be tempted to think that all corals would tolerate these extremes of temperature—most Hawaiian corals would probably be in a lot of trouble, for example—but these corals are doing quite well at the relatively warm and variable temperatures they experience. Forereefs directly exposed to oceanic water closely parallel the temperatures of those water masses, and usually experience little daily fluctuation in temperature (usually less than 1 °F). Many reefs, however, are subject to more restricted water exchange and are often subject to temperatures several degrees higher or lower than the oceanic water masses adjacent to them, depending on the season. Daily temperature variation is also much larger in these areas—3-5 °F is not unusual, and 10+ °F daily variation occurs in some places. Coral reefs are complex, there’s no doubt about it. Conclusion Last time we examined average annual temperature trends in the water masses surrounding representative coral reefs. These averages correspond fairly well to the average temperatures on reefs directly exposed to oceanic water, but not so well to many other reefs. As water exchange with the open ocean becomes limited, temperature variability tends to increase. In Kane’ohe Bay, this translates to summer-time temperatures that are typically 1-3 °F higher than offshore, but that difference can be even larger, as in the summer of 1996 when a combination of factors led to large-scale bleaching on the inshore reefs. The pattern is common to other reef areas as well, such as those in American Samoa, where the temperature can swing from 82 to 90 °F all within the same day on the backreef of Ofu Island. This sort of variability is masked if we consider only monthly temperature averages of offshore water. Coral reefs are much more dynamic than these averages can possibly describe. Thus far we’ve examined temperature trends on natural coral reefs. Next we’ll address how temperature highs, lows, and in-betweens really affect coral reef organisms. References Barshis, DJ, Stillman, JH, Gates, RD, Toonen, RJ, Smith, LW, Birkelands, C. 2010. Protein expression and genetic structure of the coral Porites lobata in an environmentally extreme Samoan back reef: does host genotype limit phenotypic plasticity? Molecular Ecology, 19:1705-1720. Jokiel, PL, Brown, EK. 2004. Global warming, regional trends, and inshore environmental conditions influence coral bleaching in Hawaii. Global Change Biology, 10:1627-1641.